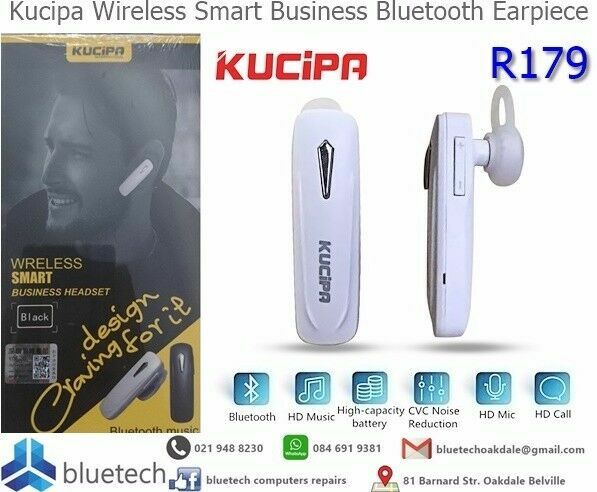 Hi, I’m interested in Kucipa Wireless Smart Business Bluetooth Headset (White) Bluetech Computers 021 948 8230. Please contact me. Thanks! The Fitbit Flex 2 is a water-resistant, all-day activity and sport tracker that can be on your wrist or, using a separately pendant, around your neck. This stylish accessory tracks your steps, distance, calories burned, and more. It utilizes SmartTrack technology to automatically detect activities like running, sports, and aerobic workouts, then sends those exercise summaries to the Fitbit app for review. Additionally, the Flex 2 automatically measures your sleep quality and features a silent alarm that vibrates to wake you up, rather than beeping which could wake others. The Flex 2 uses Bluetooth 4.0 LE to sync your data wirelessly with compatible devices whenever it's within 20' of them. Bluetooth also allows you to receive smart notifications whenever you receive a call or text. Both small and large wristbands are included to ensure a comfortable fit, as is a charging cable. Please see link below to view compatible devices. - You would need to collect from Loevenstein, Tygerberg Hills. It is in the Northern Surburbs, near Plattekloof. - Postage can also be done, counter to counter post is R49, overnight to counter is R90, and overnight to door is R49/R69/R99.